Benedictine Sisters process to Mass in their heavy serge habits. It was a hot August afternoon when Sisters Marilyn Hettinger, Sandra Mock and I arrived back at the Catechetical Center in Ladd, Illinois. We had been driving for 4 hours, returning from 2 months at the monastery in Nauvoo. We had just changed out of our traditional wool habits and into our cotton work habits when the phone rang. Father William, OSB, told us that the local Presbyterian pastor’s wife had died. Could we please represent our Catholic community at her funeral? Of course we said yes. We had enjoyed some great youth programs with our two Churches and knew that it was important to offer our prayerful support. But changing back into our hot, heavy serge habits was quite a sacrifice. And the funeral was just an hour from then. At the funeral luncheon, Father Dennis Kendrick, OSB, from St. Bede Abbey, introduced himself to us and spoke of launching an Adult Religious Education project. He and Father Timothy asked if we would participate. That conversation was fortuitous, as we had just been asked by our prioress, Sister Clarisse, to train some catechists for our parish schools in the parishes we served. We three Sisters had the experience and contacts with both the clergy and the parishioners to create just a program. We were delighted to share our practical visions with the priests at St. Bede. Together with the Benedictine priests, we launched “BREC,” or the Benedictine Religious Education Center. It was the first adult education center in the Peoria Diocese. 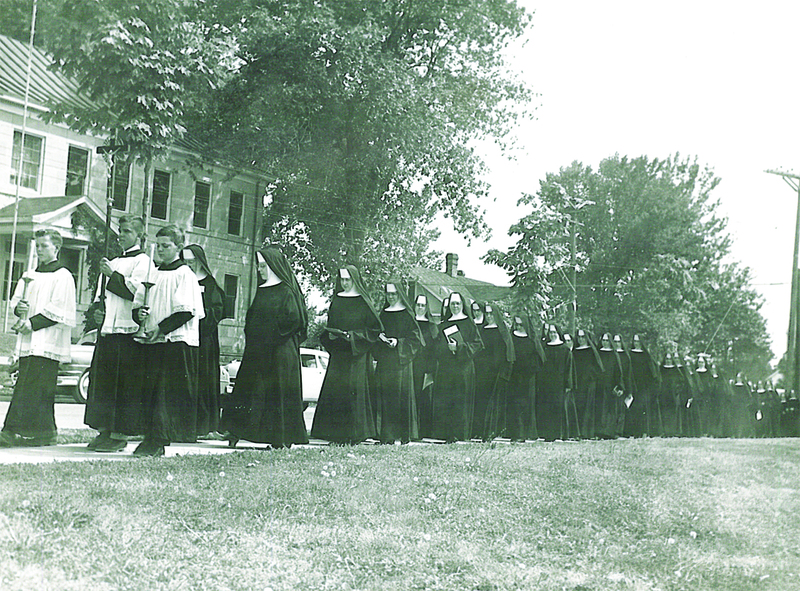 Up until this time, the Sisters had taught the children after the parents dropped them off for Catechism Class. Now, we were preparing adults to teach their own children. We worked with the parents to help them live the sacramental programs with their children, and to share the Scripture with them. Through BREC, we were able to reach many more people than we ever had before, as we gave workshops throughout the Peoria Diocese and beyond. If we had not chosen to go to the funeral in the first place, we might never have met Fr. Dennis or Fr. Timothy. We might never have experienced the joy that came from this wonderful program. Looking back on it, I see the unfolding of this program as beginning with the “Yes,” we said to Fr. William when he asked if we would go to the funeral. That “Yes” was a moment of Benedictine obedience, or listening with the ear of the heart. I am grateful to have been guided by the Spirit to listen, as Sister Joan Chittister, OSB says, “with feeling, with more than an academic interest.” It’s a challenge to listen so openly, so deeply. To listen without self interest. But when we do, we just might end up discovering, learning or doing something important!